BACPS Spring 2014 meeting |Sundews Etc. 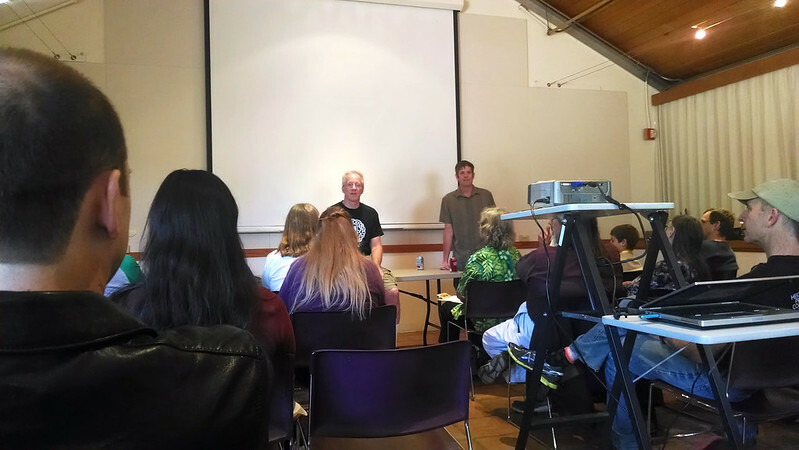 The Bay Area Carnivorous Plant Society meeting was held Saturday at the UC Botanical Garden. I'm a UCBG member, and try to visit whenever possible. 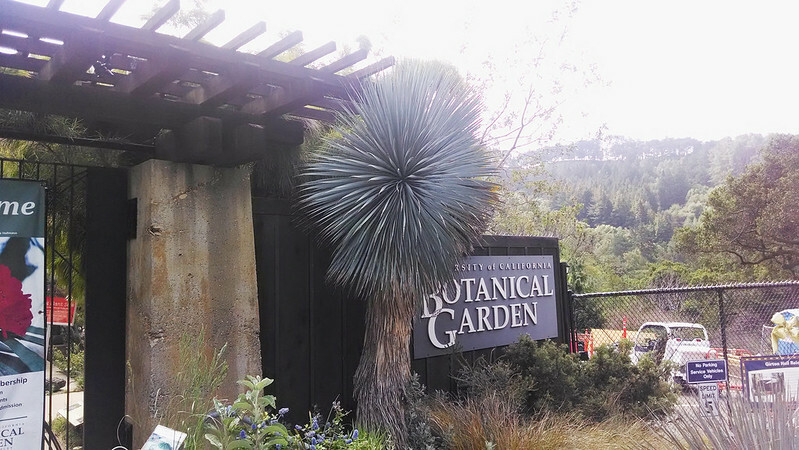 Yucca rostrata at the UCBG entrance. On this day the guy working the entrance saw the Drosera burmanii I had brought for the bring and brag and pointed me towards the BACPS meeting. Because I was headed to the meeting, I avoided my typical first stop, the spectacular Arid House. 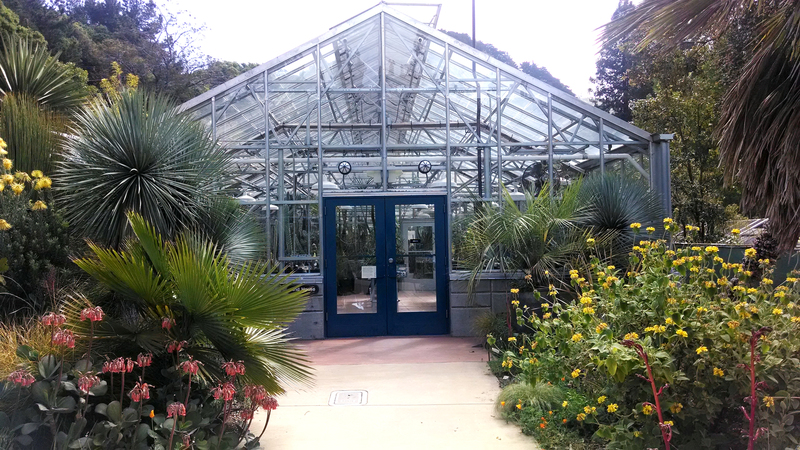 The UCBG Arid House, home of insane, spectacular plants. If you live in or occasionally visit the Bay Area you must make time to visit the UCBG. It's a truly astonishing garden. In any case, I got to the meeting a bit early, and sat around chatting with a few folks before the things got started. I also traded a smallish D. filiformis Florida All-Red leaf cutting for a few stems of Utricularia gemniscapa with Howard, who I met on TerraForums and who blogs about carnivorous plants (in Japanese) at tanukimo.blogspot.com. Use Google Translate – it's interesting to read if you like Utrics (like I do). A bit before 11 the folks from California Carnivores arrived and set up shop. 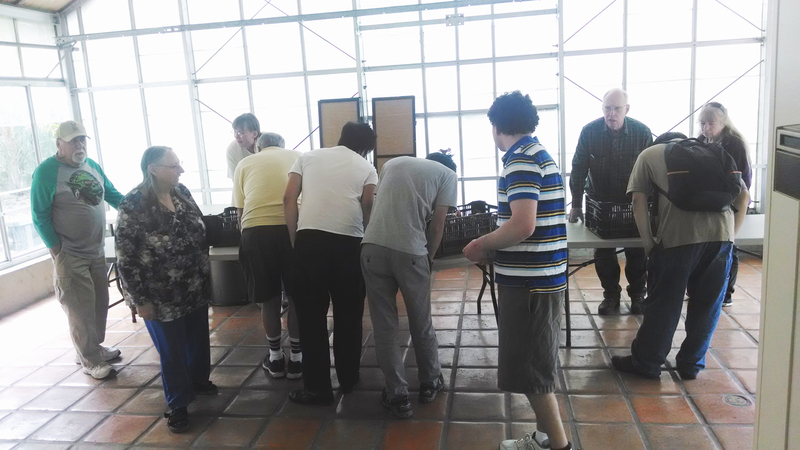 The BACPS members swarmed their tables before they even got the plants out of the box for display. I think I overheard Damon make a joke about setting up barricades to hold back the zombies, and that's pretty much what I felt like. Shamelessly swarming around the vendor table. I was right there with everybody. Most of the plants for sale were temperate and pygmy sundews, VFTs, and some truly beautiful Sarracenia. I allowed myself one plant, a very fine Sarracenia x 'Abandoned Hope'. 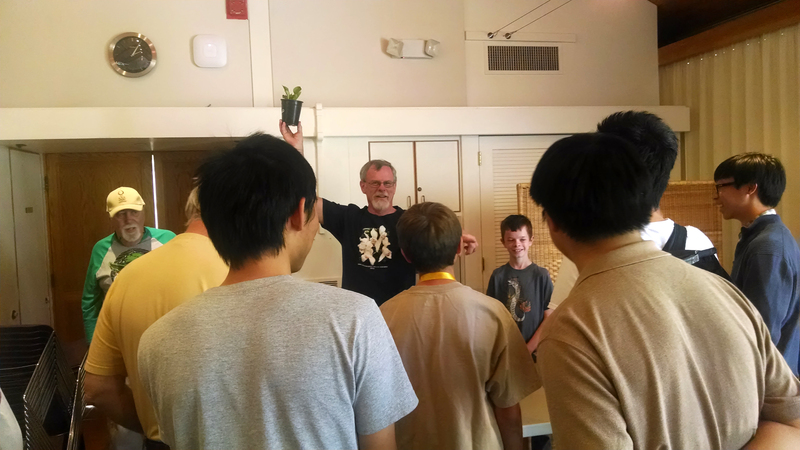 The presentations for the meeting were a talk by Damon Collingsworth of California Carnivores and Barry Rice of (among other things) Sarracenia.com about preparing one's plants to enter into the show in June, and a slideshow by Damon about Venus Flytraps in the wild. The presentations were lots of fun! Barry Rice and Damon Collingsworth talking about preparing plants for the annual show. 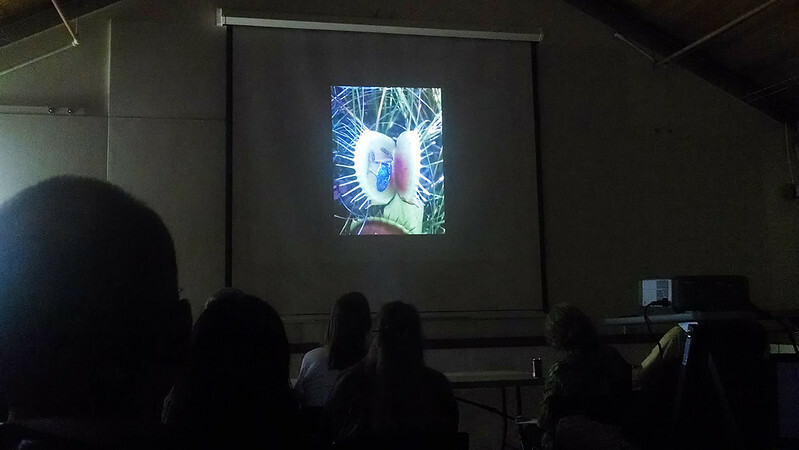 Slide of a Venus flytrap that ate a frog. Nice catch! After the talks we had the Bring and Brag. I showed off my D. burmanii Humpty Doo, and received compliments from a number of people (including Fernando Rivadavia, which was cool). We also saw this funny pair of Pinguicula cyclosecta, one of which has dormant winter leaves, while the other is already in full carnivorous summer foliage. I loved the color on these P. cyclosecta. And it's cool to see the different leaves side by side. 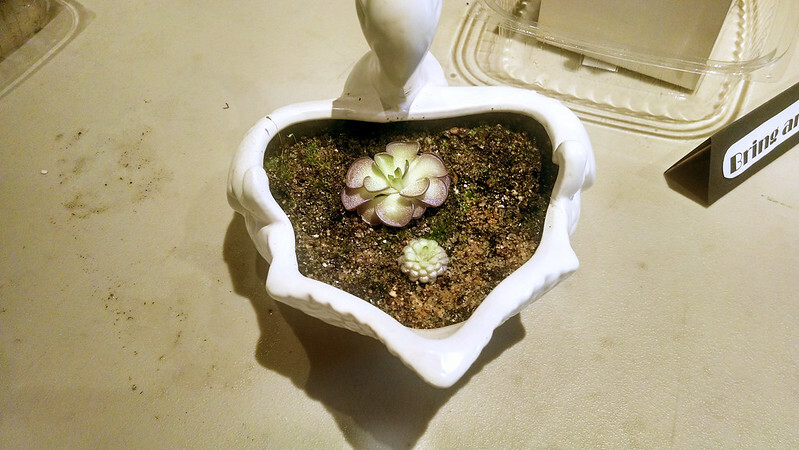 Also they were planted in this funny pot. How cute! The auction came next, and then the raffle. Several large Heliamphora heterodoxa x minor divisions brought in a pretty penny. At the raffle I got a Sarracenia leucophylla (Hurricane Creek, AL) and a small pot of D. scorpioides. This division went for like $30. I'd like to grow Heliamphora someday, but right now it's a bit much for me. After this I hung around a bit more, convinced myself not to buy another Sarracenia, and then headed home. 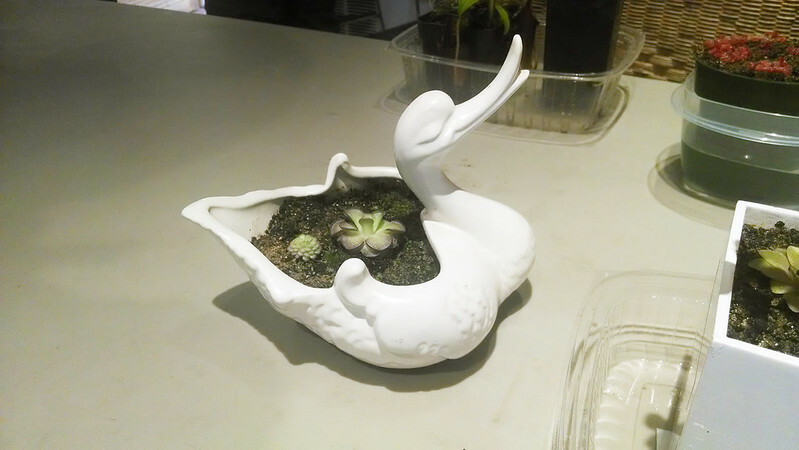 It was a lot of fun, and I came away with a few new plants and the desire to grow more to share at the next auction. Here's the final count at home. 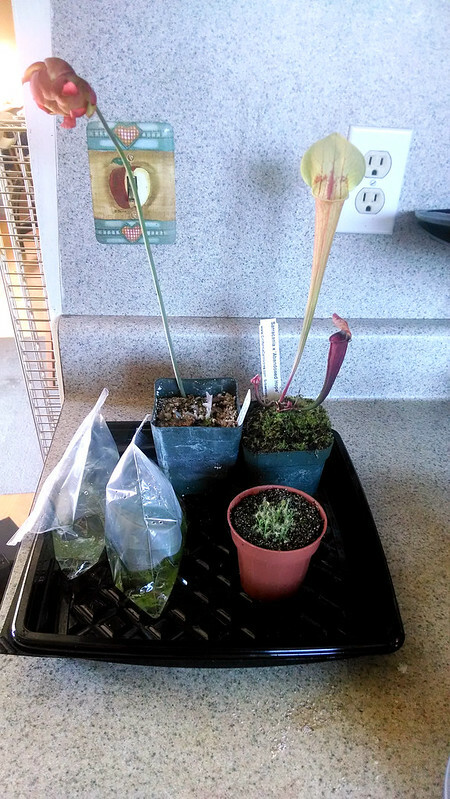 Clockwise from back left, Sarracenia leucophylla (Hurricane Creek, AL), Sarracenia x 'Abandoned Hope', Drosera scorpioides, Utricularia gemniscapa, mixed Utricularia. And because that's not a particularly lovely photo, I'll leave you with this Dudleya pulverulenta, which was so large and so glaucous that it stopped me in my tracks, arms full of plants, to take a picture. That's what the UCBG is all about. 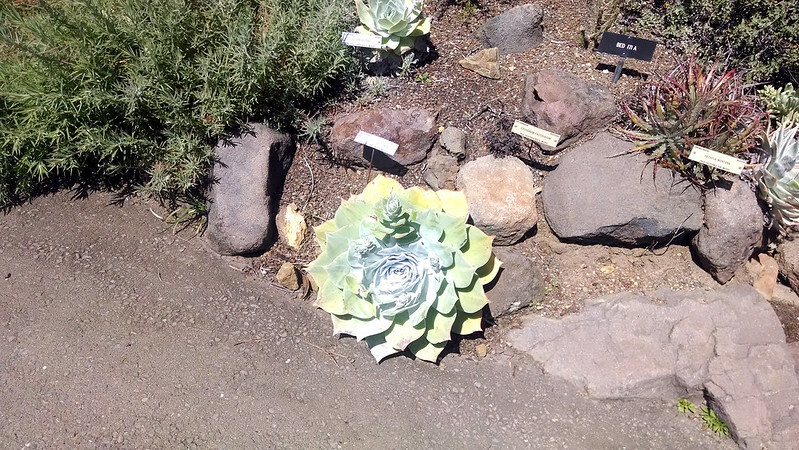 This Dudleya is like 18 inches in diameter. What a wonderful plant.